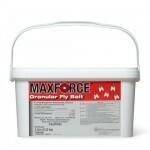 PRODUCT DESCRIPTION: Granular material that is odorless to people but strong smelling to flies. This unique formulation is both fast acting and easy to use. 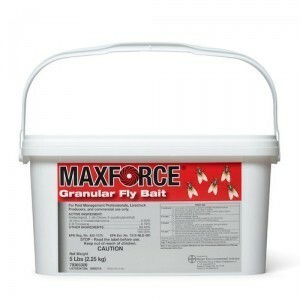 Unlike most traditional baits, Maxforce can be applied different ways. The more common placement of scattering it around can be done as can placing it in bait stations. However, it can also be applied by adding some water and then using it like a spackle compound. Sticking it in cracks and crevices and other places flies will find make this material different from any other fly bait currently available. Such placements allow for specific targeting of nuisance flies and will provide faster and more consistent results. This product uses a .5% active ingredient but is ready to use. The packs (link below) uses a 10% active but requires mixing with water. WHERE TO USE IT: Around structures where flies are active. RATE OF APPLICATION: 6 oz per 1000 sq/ft.